You'll be £19.99 closer to your next £10.00 credit when you purchase Enemies of the State. What's this? On 1 May 1820, outside Newgate Prison, in front of a dense crowd, five of the Cato Street conspirators - Arthur Thistlewood, William Davidson, James Ings, Richard Tidd and John Brunt - were hanged for high treason. Then they were decapitated in the last brutal act of a murderous conspiracy that aimed to assassinate Prime Minister Lord Liverpool and his cabinet and destroy his government. The Cato Street conspirators matched the Gunpowder plotters in their daring - and in their fate - but their dark, radical intrigue hasn't received the attention it deserves. M.J. Trow, in this gripping fast-moving account of this notorious but neglected episode in British history, reconstructs the case in vivid detail and sets it in the wider context of the French Revolution and the Napoleonic Wars. It would have been the most devastating assassination in British history; a plot to murder the Prime Minister. Yet the story of the Cato Street conspirators' attempt to murder Lord Liverpool in 1820 has, until now, remained relatively unknown compared to the antics of a Mr G. Fawkes and friends. What Trow provides here is a colourful and exciting reconstruction of not just the actions of James Ings, John Thomas Brunt and co., but their social backgrounds and political motives. As Napoleonic France faced revolution, Georgian London had its own dangerous radicals who were not afraid to resort to murder, and of the highest order, in order to make their voices heard and spark political change. What follows is a relentless journey of spies and treason, leading to the climactic capture and trials of the men followed by their hangings in breathtaking detail. This would be a compelling work of fiction but that these events actually happened in 19th century Britain, and that there is a scent on every page of 'what might have been' serves only to grasp its audience by the lapels that much tighter. In the aftermath of the Napoleonic Wars, Britain was an unstable, turbulent place. Economic hardship and the work of a reactionary government keen to preserve the status quo led to calls for reform and radicalised discontent. Although many of the flashpoints of this period have become ingrained in our national psyche, the Peterloo Massacre and the fierce debates surrounding the Corn Laws for instance, the plot by a disparate and desperate group of conspirators to assassinate Prime Minister Lord Liverpool and his cabinet in May 1820 has been curiously forgotten. 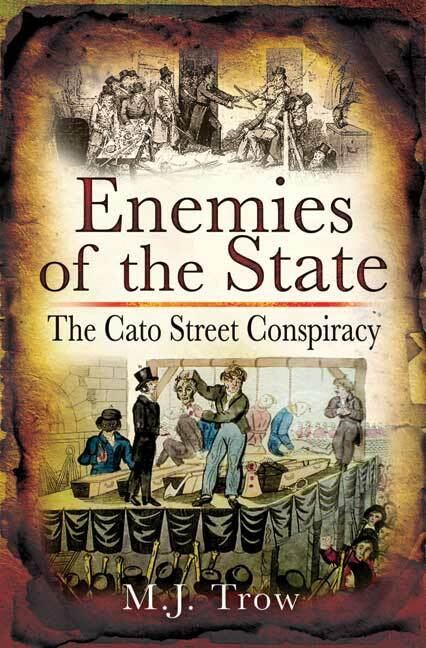 Now, M. J. Trow's new book 'Enemies of the State' reveals the intriguing tale of the Cato Street Conspiracy in full detail. With a novelist's eye for narrative, Trow follows the twisting tale of the plot, from its inception in the disappointment following the Battle of Waterloo, through the seditious, gas-lit streets of Georgian London, to its final denouement on the scaffold outside Newgate Prison. In doing so he reveals not only the actions and personal motivations of the conspirators, but also sheds a fascinating light on the role of the police, their informers, and the cruel and arbitrary nature of the judicial system in the nineteenth century, setting the plot in its wider political context. With its high drama and fascinating cast of characters, this is a tale which deserves the status of the many other more infamous might-have-beens of British history, something which Trow's gripping and incisive telling goes a long way to redress.